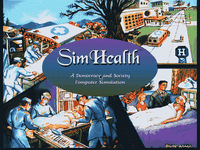 SimHealth: The National Health Care Simulation, released by Maxis in 1994, is a management simulation of the U.S. Healthcare system produced with assistance from the Markle Foundation. It was produced only for DOS, and is difficult to locate on the market today, let alone play on a modern operating system. The game was released during Congressional debates on the Clinton health care plan. An incredibly complex simulation, it was generally regarded as difficult and dry.Armed with none of the tongue-in-cheek humor that Maxis' prior games were known for, the only real link to the franchise was the SimCity 2000-inspired user interface. Noel Fritzinger, who with Lyman Orton first conceptualized CommunityViz, says that his inspiration came from seeing SimHealth and wondering if the same concepts could be applied to real-world land-use planning.